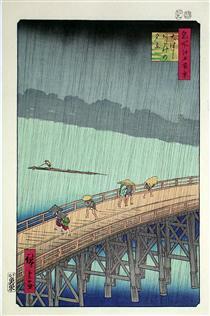 Hiroshige was born in 1797 in the Yayosu Quay section of the Yaesu area in Edo (modern Tokyo). 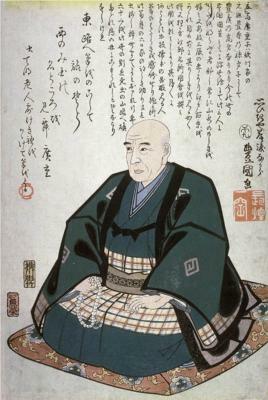 He was of a samurai background, and was the great-grandson of Tanaka Tokuemon, who held a position of power under the Tsugaru clan in the northern province of Mutsu. 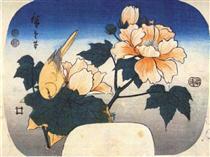 Hiroshige's grandfather, Mitsuemon, was an archery instructor who worked under the name Sairyūken. 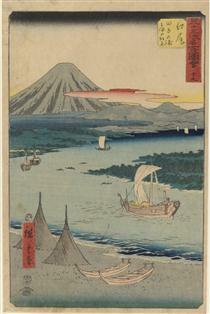 Hiroshige's father, Gen'emon, was adopted into the family of Andō Jūemon, whom he succeeded as fire warden for the Yayosu Quay area. 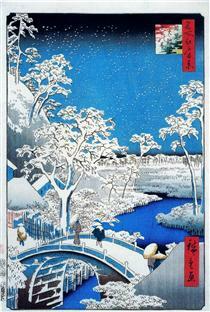 Hiroshige went through several name changes as a youth: Jūemon, Tokubē, and Tetsuzō. 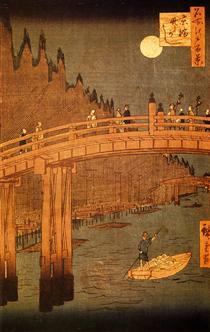 He had three sisters, one of whom died when he was three. His mother died in early 1809, and his father followed later in the year, but not before handing his fire warden duties to his twelve-year-old son. 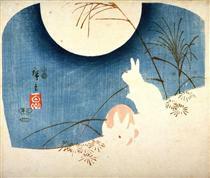 He was charged with prevention of fires at Edo Castle, a duty that left him much leisure time. 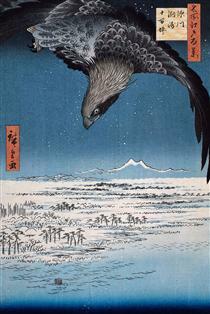 Not long after his parents' deaths, perhaps at around fourteen, Hiroshige—then named Tokutarō— began painting. 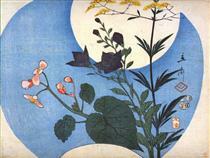 He sought the tutelage of Toyokuni of the Utagawa school, but Toyokuni had too many pupils to make room for him. 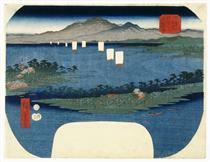 A librarian introduced him instead to Toyohiro of the same school. 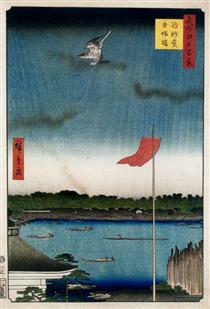 By 1812 Hiroshige was permitted to sign his works, which he did under the art name Hiroshige. 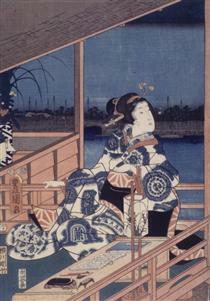 He also studied the techniques of the well-established Kanō school, the nanga whose tradition began with the Chinese Southern School, and the realistic Shijō school, and likely the perspective techniques of Western art and uki-e.
Hiroshige's apprentice work included book illustrations and single-sheet ukiyo-e prints of female beauties and kabuki actors in the Utagawa style, sometimes signing them Ichiyūsai or, from 1832, Ichiryūsai. In 1823, he resigned his post as fire warden, though he still acted as an alternate. 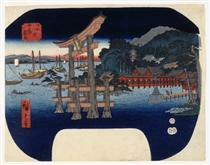 He declined an offer to succeed Toyohiro upon the master's death in 1828. 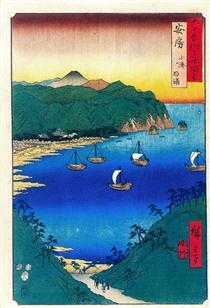 Bay at Kominato in Awa Province Hiroshige ? 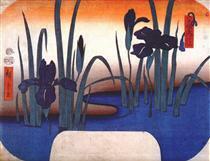 First Cuckoo of the Year at Tsukudajima Hiroshige ? 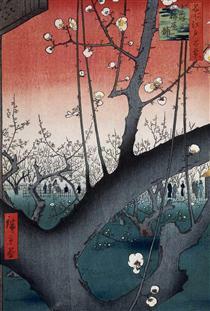 Prune Orchard Sun Hiroshige ?